Terry Benson serves as the business area manager for communications systems at Overwatch Tactical Operations. In that role, Terry is responsible for program management, business planning, and new business development. He joined the company in 2005 to lead the SATCOM business area, and hes overseen program execution, business development, and strategic plan development. Terry has more than 24 years of industry experience, working in the military and commercial markets. He received a bachelor of science degree in electrical engineering from Texas A&M University in 1984 and a master of science degree in engineering management from Southern Methodist University in 1990. Terry is also a registered professional engineer in the state of Texas. Terry, there may be many readers who are unfamiliar with your company... what is Overwatch Tactical Operations and what makes the company unique in the industry? The company was founded in 1992 as Austin Info Systems, and was later renamed Overwatch. In 2005, it became an operating unit of Textron Systems, a Textron Inc. company. Textron Systems is the cornerstone of Textrons defense and intelligence business, which, apart from Overwatch Tactical Operations, includes aerospace and defense experts AAI Corporation, HR Textron, Lycoming Engines, Overwatch Geospatial Operations, Textron Defense Systems and Textron Marine & Land Systems. This breadth of experience serving military customers gives us greater insight into their needs, as well as a unique ability to meet those needs. Overwatch Tactical Operations offers expertise in several areas, including command, control, communications and intelligence (C3I) systems, course-of-action development, knowledge-based discovery, data mining and intelligent searches, knowledge representation, software agent development, digital communications switching, and remote radio control hardware. We also are a proven provider of satellite communications (SATCOM) products and integration services. A large part of what makes us unique is our level of experience. Weve been designing, developing and fielding these solutions since the early 1990s. We are focused on delivering this technology with high quality, within cost and on schedule. Because of that, we have robust continuous improvement programs which have resulted in certifications including AS9100, ISO 9001-2000 and Capability Maturity Model Integration, or CMMI, Level 5. How long have you been with the company? Describe your position at Overwatch Tactical Operations, as well as previous industry background. Our SATCOM business unit is focused on providing military communication systems for a number of domestic and foreign applications. In 1997, the company developed a unique tri-band feed and antenna system under a Small Business Innovative Research contract with the U.S. Army Communications and Electronics Command. The feed required no mechanical changes for operation in the C-, X-, and Ku-bands. We received the U.S. Army Phase II Quality Award for this development in 1999. Since then, Overwatch Tactical Operations has continued this development and the company has been granted two patents for its simultaneous multiband, single-feed technology. Today, Overwatch Tactical Operations provides single-band (including L-, S-, C-, X-, Ku- and Ka-bands) and simultaneous multiband (including X/Ka, C/Ku, X/Ku, Ku/Ka, C/X/Ku, X/K/Q, L/S and S/X bands) SATCOM system solutions. Our fielded systems have been utilized by military customers for flyaway, transportable, fixed-site and shipboard applications. We also are a full-service satellite communications solution integrator. Overwatch Tactical Operations has experience with all aspects of SATCOM system design, integration, performance testing and certification (including Intelsat, Americom Government Services and Defense Satellite Communications System). In addition, we have designed, developed, certified and fielded low passive intermodulation, or low PIM, simultaneous X/Ka multiband shipboard antennas. Please describe the companys patented multiband feed technology. Why is it essential to your customers? The Overwatch Tactical Operations patented feed technology combines dual polarization with multiple frequency band coverage into a single feed that can be fitted onto new or existing antenna systems. This technology reduces footprint and minimizes life cycle cost, both of which are important considerations for our customers. This technology has been applied to a number of systems, including flyaway, fixed (or teleport) and shipborne, and is readily applicable to mobile applications. The multiband feed design consists of coaxial, concentric waveguide cavities that operate in TE11 mode. Normally used in circular waveguide feed design, this mode also is suitable for use in coaxial waveguide. The large, outermost cavity of the feed operates in the lower frequency band, while the innermost cavity operates at the higher frequency band. The antenna is fed with orthogonal waveguides for polarization diversity in all bands. The coaxial cavity feed is ideal for this application because the feed produces high-efficiency, near-optimum illumination patterns and coincident phase centers in both bands simultaneously. Because it is a waveguide design, the input power levels used in SATCOM systems do not present breakdown problems1. This feed has proved to be an ideal multiband illuminator for parabolic reflectors, and therefore could be used in many military and commercial applications that require multiband operation1. A dielectric lens on the aperture focuses the feed to match reflector optics. As a result, the feed design can be adapted to multiple reflector designs simply by changing the lens. Radiation patterns of the feed without the lens are fairly broad, limiting the antenna designs upon which the feed could be deployed successfully. The lens allows the radiation pattern to be tailored to the optics of an existing antenna system, expanding the available antenna uses. Since the lens acts as a broadband device, the radiation pattern is similar across both bands. As a result, similar efficiencies can be achieved in both bands. The lens concept is another Overwatch Tactical Operations patented technology that has been used successfully in antenna systems with multiband feeds. In what ways do Overwatch Tactical Operations military SATCOM technologies enable your military customers to better perform their missions? By providing transmit and receive for two bands simultaneously, our customers can effectively double their communications throughput. This advantage allows them to more quickly and effectively adapt to evolving requirements in theater. Scenarios change quickly in forward environments, so flexibility is of vital importance to assessing a situation and responding to it quickly without the added concern of equipment capability. 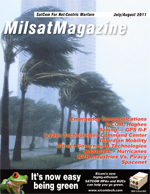 For example, one possible scenario using Wideband Global SATCOM, or WGS, satellites would allow the same terminal to connect to assets within the continental United States in X band with a large data pipe, while also allowing connectivity to multiple tactical users on the battlefield utilizing Ka-band. What are the benefits of dual-band systems for your military customers? These solutions offer three substantial benefits for our military customers  increased throughput and capacity for a single terminal, a smaller system footprint, and reduced life cycle costs. These represent increased functionality and maximized system value. As Overwatch Tactical Operations has been on the forefront of this technology, many potential customers were not aware that this capability was available. As we have presented the possibilities and demonstrated the capabilities with working hardware, new applications continue to present themselves as customers realize all that they can accomplish with dual-band systems. The companys SATCOM antenna systems are offered in flyaway and shipboard configurations, as well as fixed. How are the non-fixed antennas designed to offer comparable performance compared to a fixed option? Fixed, or teleport, systems are typically large-aperture antennas that serve as direct communication links for a given satellite, whether in theater or here in the United States. Given that most of the newer satellites are multiband; for example, the WGS, simultaneous multiband capability at the teleport or fixed site allows them to match the capability of the satellites with which theyre communicating using a single antenna. Multiband capability in a single terminal also saves users the additional real estate and life cycle costs associated with another large antenna. The operational aspects of smaller terminals such as shipboard, flyaway, transportable, or very small aperture terminals require a different set of capabilities. In the case of a shipboard system, multiband provides increased capability without increasing the impact on the decks footprint. After all, space is typically at a premium aboard ships. Other shipboard applications address regulatory concerns where the ability to seamlessly switch frequency bands; for example, from C- to Ku-, is necessary when entering some ports of call without manually changing out a SATCOM feed. For other transportable or flyaway systems, multiband provides the flexibility to seamlessly switch between two bands or to operate in both bands simultaneously. These capabilities are essential for military customers so they can meet the demands of emerging in-theater operational scenarios. Overwatch Tactical Operations also is a SATCOM system integrator. How do your military customers benefit from this experience? How is it to their advantage to have your company field their systems, as opposed to gathering and integrating the various components themselves? Overwatch Tactical Operations can provide anything from an integrated quad-band flyaway terminal to feed solutions for existing antennas. Different customers require different levels of integration and support, so we tailor our solution and approach to their unique requirements. Some customers contract with Overwatch Tactical Operations for the complete antenna and feed assembly while others may request our feeds with the goal of creating their own reflectors or retrofitting an existing reflector. In the latter case, it is important that we act as a partner during the reflector modeling and testing process to ensure that the integrated antenna product will perform to specifications. How do you see SATCOM technologies maturing even further in the next several years? What are the new and vital military missions these products will need to perform? Its my belief that with the advent of WGS, military communications will continue to increase their reliance on both military and commercial satellite capacities. In the past, multiband terminals achieved that capability by swapping feeds. With an eye toward the future back in 1997, we believed that a more robust solution was necessary. As a result, the Overwatch Tactical Operations patented multiband technology was developed to provide maximum flexibility and increased operational capacity. This technology allows our customers, both military and commercial, to fully utilize the capability of satellites that are being launched. For more information on Overwatch Tactical Operations products and services, visit www.overwatch.com. To learn about the larger Textron Systems organization, visit www.textronsystems.com. 1  Cavalier, Mark D. and Don Shea, Antenna System for Multiband Satellite Communications, MILCOM 97 PROCEEDINGS, November 1997.